New Russian American Nik discusses latest #hrdpar. This entry was posted in Audio, Audiochats and tagged #HRDPAR, #NZmosque on March 16, 2019 by ab. hadn’t listened to any Fak’s in a while – but hearing Nik Research join the Discord was a most welcome undercard to what was ultimately an underwhelming bout last night between Spence and Garcia. i randomly – or not so randomly – arrived on his channel a couple of years ago and listened to several impressive multi-hour broadcasts before conking out. wouldve been great if JLB stuck around to referee the historical and geological shadowboxing between he and Gaia, but I loved how it wasn’t a newbie love fest …and cut straight to impasse points – be they rock formations or ‘wood’ dustifications :P.
looking forward to more of these, and if Nik is truly bored in NY…he’s another I’d gladly treat to some LI Teas or non alcoholic beverage of choice. Hmmmm Rick [Exoteric64] thinks all the NZ paramedics are going to go shouting their heads off that it was a drill…. Suuuuuuuure they are, just like they did after the London bridge attack and every other event which relies on these tight-lipped masonic brother- and sisterhoods…. Would it be normal for the St John Ambulance to attend here in the first instance? Perhaps some New Zealander can answer. 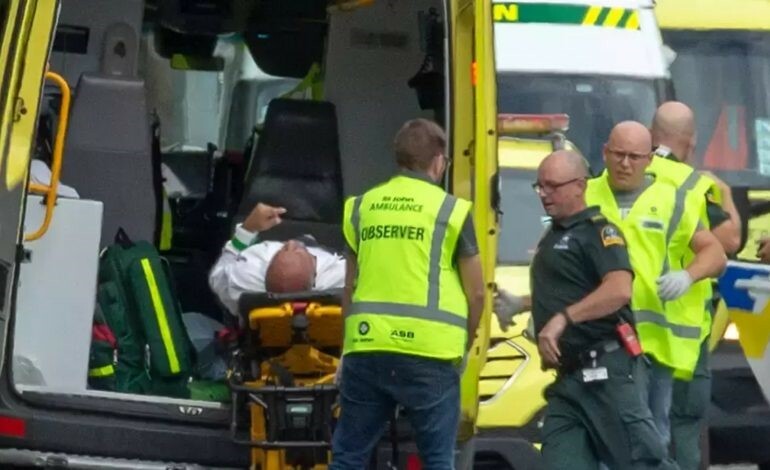 Police commissioner Mike Bush…has praised the work of everyone, from local authorities to St John Ambulance staff and, in particular, imams for their help in dealing with the aftermath. i.e. everyone who made this HRDPAR film possible. Keeping a secret is as easy as keeping a job therefore I doubt there will be any loose lips for anyone who thinks they are in the know. This is known as an implicit, not explicit Force and anyone who’s been part of a company or a union or a Brotherhood or a cult or a clique or a gang knows what I’m talking about . @12.45 JLB makes up a name – Paul Paulson. Is he, by chance, a relative of Paolo Waolo? Don’t go there it’s silly. You’re right, that was silly. Apologies. JLB was boring me. Yes and all the tributes to the other SIM villains in the other five eyes countries referenced by our sim kiwi shooter. Their script is repetitive, pedestrian, and boring. When the script is , as you rightly describe it, so formualaic, I can’t waste any time analysing the videos or looking at the pedigrees of these untraceable, relocated [and perhaps relocated again…] “victims”. It gets even sillier – they “find” an extra body a day later in one of the mosques, bringing up a round five-o to match the “injured” total. The bad acting award must go to the guy in this BBC video, “Ali Adeeba”, as he reads his script, after careful rehearsal no doubt…bringing up, in addition, all the hoax markers – “surgeries” “induced coma” etc.etc. New voice from new york nik, and his views, plus others on the latest hrdpar and media fakery.